Users can easily create a custom device profile that is compatible with each medium or ink by following wizard guides, and a customized device profile*1 utilizes the characteristics of media or inks and provides the best print results satisfying clients' needs. In addition, an input profile-creation capability*2 is planned to enable the creation of input-output profiles. MPM3 provides a profile for satisfying clients' needs and broadens users' business opportunities. *1: An output profile used for Mimaki RIP software, RasterLink series. *2: This capability will be available on version 3.1.1 and later. Moreover, MPM3 enables users to create a profile that accommodates "Mimaki Expand Color," a new input profile of RasterLink6*3. 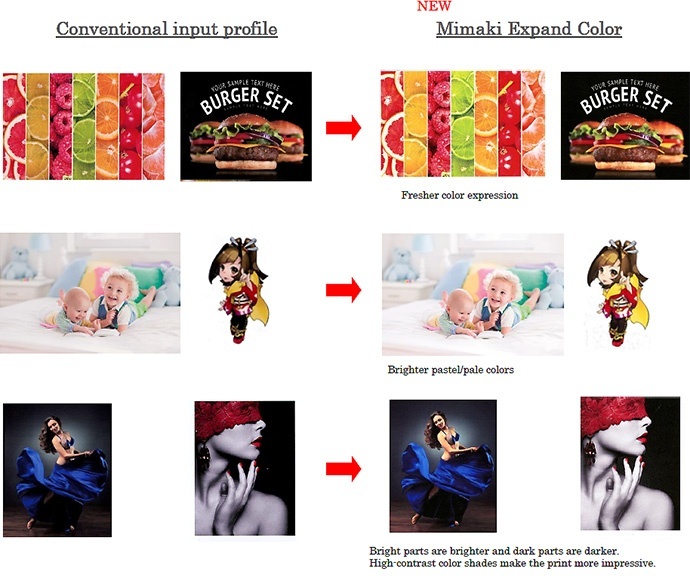 "Mimaki Expand Color" can reproduce more vibrant solid colors and brighter skin tones than a conventional input profile and provide more attractive print results with high-contrast color shades; bright parts are brighter and dark parts are darker. 1) Emulation: Reproducing colors that are equivalent to those printed by other manufacturers' printer models. The new emulation capability reproduces colors that are equivalent to those produced by different printer models, including ones from other manufacturers, by measuring color charts with a colorimeter. This capability eliminates color-matching issues that occur when replacing or adding printers. 2) Equalization: Matching colors among the same printer models. The useful equalization capability of MPM2 is also included in the new software. 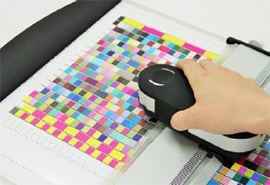 Color differences among multiple printers are simply equalized by measuring color charts. This capability allows the same image to be printed with multiple printers simultaneously, thereby enabling large-lot orders to be completed in a short time or undertaking urgent orders. After printer maintenance, in particular, after printhead replacement, print colors may differ from the specified ones. Color differences are calculated after measuring color charts using a colorimeter. Since the differences are described as numerical values,*4 anyone can recognize and correct color differences without special knowledge. *4: Delta E (ΔE) values are used for describing color difference.